Stormy Night joins a long list of films about forbidden friendships and, despite its origins as a children’s book, is surprisingly philosophical and well suited for adults and kids. The movie runs a little long and lacks a distinctive animation style, which is a little disappointing considering the many landscapes used. It also opts for some mechanical and clichéd Looney Tunes gags, but it’s a touching story that proudly wears its heart on its sleeve. 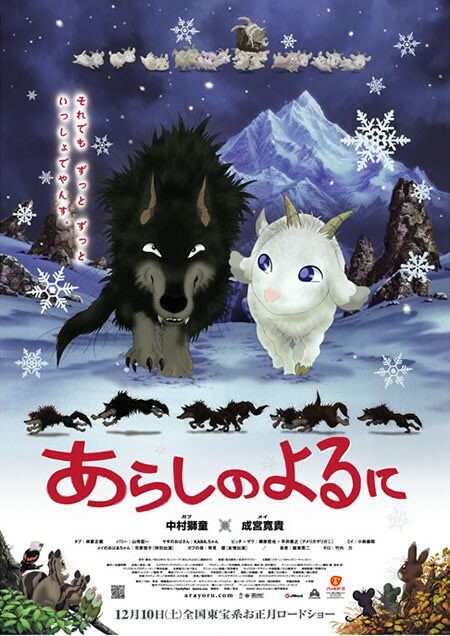 When a goat Mei and a wolf Gabu begin to grow close after taking shelter in the same barn one stormy night, they don’t realize how much their friendship will test their loyalties to each other and to their pack or herd, not to mention Gabu’s stomach. The traumatic opening scene, rather than being a bad start with the promise of better things to come, sets the film’s complex emotional tone. That the animated story involves a pint-sized goat and furry wolf shouldn’t fool you into thinking this is a lightweight tale. It’s a life or death existence for both friends and their fellow goats and wolves, and the two barely get any respite from the realities they face. Mei and his herd must be remain vigilant lest they become goat chow while Gabu and his pack are on a constant chase to fill their stomachs, especially as winter approaches. The movie tries to put predators and prey on equal footing, but the wolves still come off needlessly evil. Anyone who’s seen The Lion King will recognize the pack leader’s distinctive eye scar, and Gabu’s dim, yappy friends are exceedingly hyena-like. Even Gabu doesn’t seem all that friendly, though few things do compared to Mei’s dewdrop eyes. Having found a playmate in one another the two vow to remain firm friends, but it’s not long before they are discovered and chastised for this unnatural friendship. Mei’s herd are convinced he’s been tricked by a wolf so clever he doesn’t even need sheep’s clothing. They tell him that Gabu is only feigning good will in order to better track the herd’s movements. At the same time, Gabu’s wolf pals relay with equal certainty their belief that Mei’s fondness for him will turn to hatred once he realizes that his herd have been eaten by the wolves. Both are sent on a mission to exploit the friendship and uncover the real intentions of their enemies. The suspicion and animosity that threaten this innocent relationship can be difficult to watch. I didn’t expect to be so overwhelmed as Mei and Gabu waxed lyrical about true friendship, though in doing so I easily recalled any number of real-world hostilities in which the simplicity of two people being together is rendered impossible. While kids may not be thinking about the Israeli-Palestinian conflict, they will at least begin to understand that life is fraught with bitterness but also that love goes a long, long way. Posted in Asian movie reviews, Japan and tagged animated movies, drama, family films, Japanese film reviews on July 19, 2015 by limmer13.